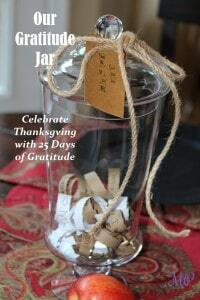 Last year, we started a new tradition that our kids are already asking about: Our Gratitude Jar. We found a jar lying around our house and tied twine around the handle for a simple decoration, and you can do the same. We cut pretty paper into strips. Leftover scraps of paper or torn brown bags will work. Each day starting November 1, we each write one thing we are thankful for. By Thanksgiving, our jar is full and so are our hearts. From our family to yours, we challenge you to do this every day in November and feel the fullness of your heart by Thanksgiving. Don’t worry if you miss a day- you can catch up! You will be amazed at all you can come up with to be thankful for! We ALL have been given much, and when we celebrate what God has graciously given us, the discontent and insatiable appetite for more fades, and we focus more on what we can do for others. This prepares our children, and ourselves, for the coming season of Christmas. As we have opportunities to give, we do so more freely, out of our gratitude and thankfulness. By the time Thanksgiving comes, our gratitude jar is full and so are our hearts as we celebrate Thanksgiving and begin the season of celebrating the birth of our Savior! When we focus on all we have, we feel free to share that with others. Gratitude shows up in a smile, a helpful hand to a stranger, or possibly even a small gift. This love towards others is what Christmas is all about. It’s what our kids need to see in us, and through these expressions of gratitude, people see God’s love.